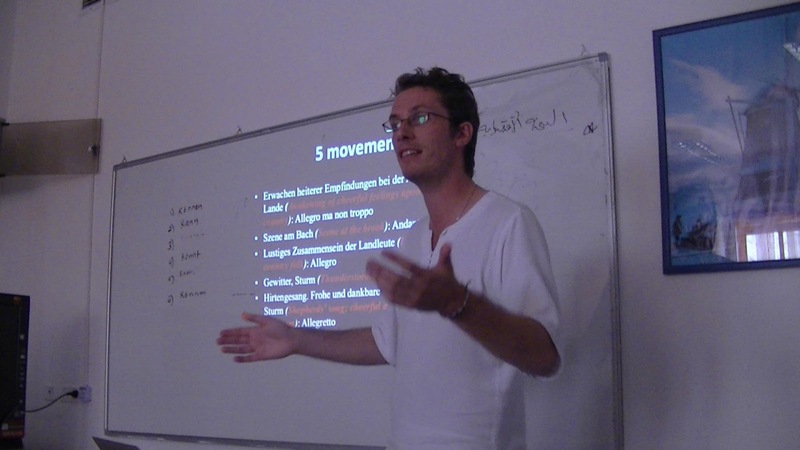 On July 16th French musicologist Dr. Nicolas Dufetel visited the campus of Al-Quds University in Abu Dis followed by two lectures at the music department. He gave a reading on “Orientalism in Western Music” and offered fascinating insights and backgrounds to elements of music history, music analysis and aesthetics. Dr. Dufetel who has been invited by the Consulate General of France through the French Cultural Center in East Jerusalem and the Edward Said Conservatory is based as musicologist at the Institute for Musicology in Weimar (Germany) and the University of Angers (France). He furthermore acts as artistic adviser and organizer of the Liszt Year 2011 in France. His lectures focused on the presence of oriental elements in 18th-19th Century Western Music. They were illustrated with works by famous composers such as Mozart, Beethoven and Borodin as well as the little known Félicien David and showed references to contemporary trends in and the arts in order to understand that Orient and Occident have always been somehow linked in the world of the Arts, and especially in the world of music. The vivid reading has been accompanied by astonishing images and musical examples as well as live piano playing, inspiring the audience to "listen" to classical music in a different way. After this highly instructive and at the same time delightful musical encounter Al-Quds University hopes to develop further programs and academic events with Dr. Dufetel, the music department in Abu Dis and the new Al-Quds University College of Music in Jerusalem.